My name is Cal Williams and I am a rising senior in high school. Last summer, my friend and I came up with and pitched a business proposal. 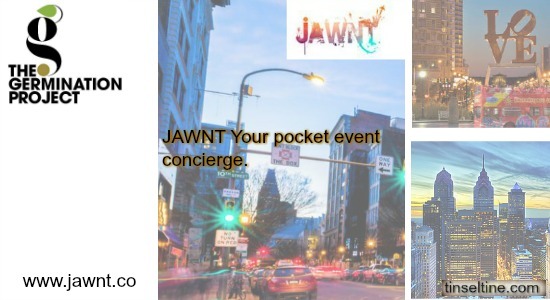 Our company, Jawnt is a Philadelphia-specific company that specializes in planning one’s night for them. Currently, we are doing dinner reservations only. To gain a customer base, we figured it would be effective to reach out to people like you for a possible partnership. We would ask that in exchange for a spot on our website under “partners,” we would ask to be featured on your blog or website. Now when I received this email I thought, Nice! Guess I'm more visible than I sometimes feel. And Wow! Love this younger generation taking the bull by the horns and entering the entrepreneurial arena even before college. I wish when I was in school a mentoring program existed like The Germination Project, which is helping Cal and his partner Thomas get rolling with JAWNT. Heck, I wish I had a mentoring program right now which could teach me how to truly monetize Tinsel & Tine. T&T: Of all the businesses you could start, why a Philly Concierge business? And did you have another idea first which morphed into Jawnt? Cal Williams: Both Thomas and I are from the Philadelphia area. When we were tasked with developing an idea to help Philadelphia and its people we recognized a need in the entertainment and dining industries of the city. For young people it is getting harder to make plans or find a restaurant in the city that fits your interests and budget. Jawnt was created to answer the lifelong question, "What are we going to do tonight?" Nothing morphed into Jawnt, but there was a lot of planning that went into the launch and the first draft of our website. T&T: What experience do you both have to feel qualified to give recommendations to others about the hidden gems of our city? CW: Growing up in Philadelphia, we both have been to our fair share of "hidden gems" in our city. But in addition to our knowledge, one of our goals is to reach out to interested parties or to have restaurant owners and event organizers reach out to us so we are able to feature up-and-coming establishments in the city as well. T&T: Is Jawnt aimed towards visitors or Philly Natives? CW: Both. During the development stages, this was a big topic of conversation. We were unable to truly identify if our company was best suited for tourists or the citizens of our city. After much deliberation, we came to the conclusion that it can be both. The first stage of Jawnt is just focusing on restaurants, but eventually we will develop an app and it will be easy and quick for anyone and everyone to use our service. T&T: What do you like most about being a part of The Germination Project? CW: The Germination Project has given the two of us and our fellow classmates the ability to grow and gain the resources to be smarter, savvier entrepreneurs. By bringing together some of the best students in the Philadelphia area, the Project has encouraged us to grow and develop through peer interaction and collaboration. The Germination Project has given us the tools for success and the opportunity to come up with ways to better our communities and our city. T&T: What has been the hardest part of being a part of The Germination Project? CW: Nothing about the Project itself has been hard. However, before being chosen for the Germination Project, there were a series of interviews. The interviews were like nothing I had ever been through. When you are fifteen years old and still unable to drive or do much independently, it's pretty intimidating to walk into a Center City office building and sit at the head of a Board Room table in front of eight leaders of Philadelphia that could shape your future. This was intentional, and it was a great test of how we would act under pressure. It was a challenge for all of us and the interviews alone gave us unparalleled experience which we will all be able to use as we approach college and future job searches. About the Germination Project: By identifying, nurturing, encouraging and connecting the best and brightest of Philadelphia’s young generation–from their high school years through their careers–and committing their talents to the greater good, The Germination Project is building a self-sustaining ecosystem of leadership to transform this region. Through institutional partnerships with universities, healthcare organizations and technology firms, the Germination Project empowers student fellows both with the skills to build successful careers and a sense of civic duty to deploy those skills for the benefit of Philadelphia’s underserved communities.